After closing the splash, the startup scene is displayed in the 3D View if no other blend-file was loaded. A customized startup scene can be saved as a part of the startup file. 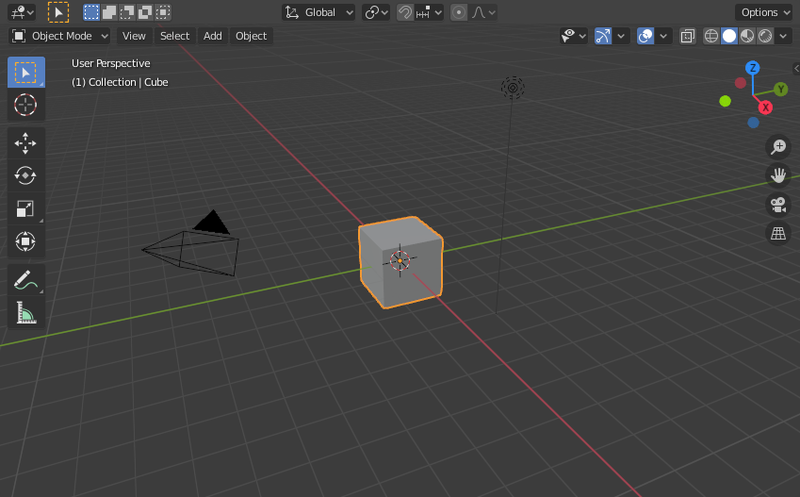 The gray cube in the center of the scene is a mesh object. Because the cube is selected it is drawn with an orange outline. The Origin of the object is displayed as an orange dot and it marks the cube’s (relative) position. This widget is composed out of a white circle and three colored (red, green, and blue) arrows. It is used to move entities (e.g. the cube) in the scene. The pyramid with a big triangle pointing upward is the camera used as point of view for rendering. See also: cameras in Cycles. The 3D cursor, a cross with a red-and-white circle, is used for placing objects in the scene. The gray squares forming a floor mark the zero height of the world. The red and green lines are the axis of the world coordinate system. They meet at the origin, which is also the position of the Cube. The Grid Floor settings are in the Display panel. The visibility and settings of the overlays can be set in the User Preferences. If the viewport camera is not aligned, the view is named „User“ plus the perspective of the viewport camera. Displays the Frames Per Second screen rate, while playing an animation back. Shows the axes of world coordinate system as plain lines with name. Shown in brackets is the current frame. Followed by the name of the active object. And optionally the selected shape key and in brackets (<>) the Markers name on the current frame. The color of the Object Info is set by the State Colors (keyframe only).